The cell is a factory where every component needs to be in its proper place at the proper time for continued function and survival. A new study by researchers at the Indian Institute of Science, Bengaluru, explores how cells manage this remarkable feat of ensuring that the right molecules find their way to the right locations within the cell. Chances are you have ordered something from Amazon lately. In order for the package to reach your doorstep, it had to pass from warehouses to shipping hubs to delivery operatives, all within the span of a few days or weeks. Had there not been clear directions each step of the way, it may have ended up a thousand miles from your home (as quite a few irate customers from the early days of online shopping can attest). ‘Packages’ reaching their correct destinations is even more crucial within the cells in our bodies, as our health and survival can sometimes depend on it. In a recent set of studies, researchers led by Subba Rao Gangi Setty from the Indian Institute of Science, Bengaluru, have identified a pair of proteins which ensure that cellular cargo is correctly sorted and distributed to their proper locations within the cell. Cells are huge factories with millions of different components, many of which need to be in a precise place at a precise time to ensure smooth functioning. The endocytic pathway plays an important role in regulating this process. The pathway consists of endosomes, which are membrane-bound sacks containing different types of cargo (usually proteins and lipids) and a number of other cell organelles which can fuse with endosomes. Rao’s team was interested in understanding how this process is regulated at a molecular level. How does cargo get sorted within an endosome? How does it know where to go? How does it reach its correct destination? “As of today, these pathways are poorly understood,” says Rao. To answer these questions, the researchers chose a cell type that allowed them to probe these processes with precision - melanocytes. Melanocytes are specialised cells which contain pigment granules, also called melanosomes. Melanosomes, in turn, contain melanin, the pigment which gives colour to our skin, eyes and hair. For their formation and function, melanosomes depend on essential enzymes and proteins delivered via the endocytic system. They are also easily visible under the light microscope, which makes it easy to study defects in this pathway. To identify which molecules were involved in regulating cargo sorting and transport to melanosomes, the researchers began by looking at some of ‘the usual suspects’. The Rab family of proteins have been known to play a role in many cellular processes, including trafficking, signalling and endocytosis, which made them prime candidates. Rao’s team, therefore, decided to perturb the expression of a set of Rab proteins and see what happened to melanasome formation. For this, the researchers used a technique called an RNAi screen, which involves treating cells with small RNA molecules which prevent the synthesis of a target protein and checking the effects on the system being studied. This process is repeated in different sets of cells for every target protein. This method gave the authors a way to quickly and clearly identify proteins that played an important role in melanosome formation. One molecule in particular gave the scientists pause. Rab4a, when knocked down, led to a decrease in the total amount of melanin present in the cell (hypo-pigmentation). The researchers found that this was because some of the proteins required for melanin synthesis were missorted and ended up getting degraded instead of reaching the melanosomes. Upon further investigation, the researchers found that Rab4a localises to the membranes of sorting endosomes, which act as hubs from which cargo is sent out in different directions. Further experiments showed that Rab4a acts as an organiser, recruiting a set of specialised proteins and protein complexes to the sorting endosome membrane. These proteins then help in segregating cargo for transport to the melanosomes. Thomas Pucadyil, Associate Professor at the Indian Institute of Science Education and Research (IISER) Pune, who not associated with this research, calls the RNAi screen the highlight of the study. “Any screen is only as good as the phenotype (or lack thereof) it exploits,” he says, adding that the clear phenotypes observed by using the melanosome as the study system mark a significant advantage over traditional methods. 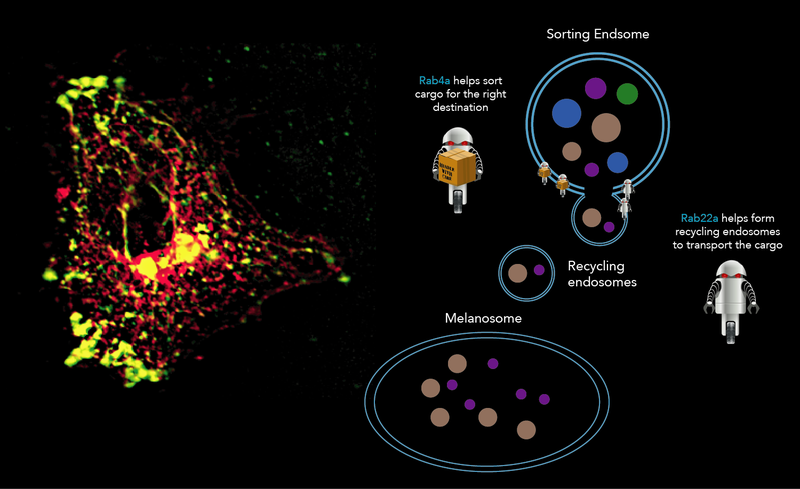 Rab22a, the second protein identified by Rao’s team did not play a direct role in sorting the cargo, but was crucial for the formation of recycling endosomes, which, in melanocytes, transport cargo from sorting endosomes to melanosomes. Like Rab4a, Rab22a also acts as a recruiter, this time for proteins which allow part of the endocytic membrane to bud out and form a delivery pathway for the cargo. These include a pair of protein complexes known as BLOC-1 and BLOC-2, defects in components of which have been linked to cases of Hermansky-Pudlak syndrome, a rare form of albinism in humans.